A while ago I told you all about training Ladybird and getting ready for the 4-H fair. 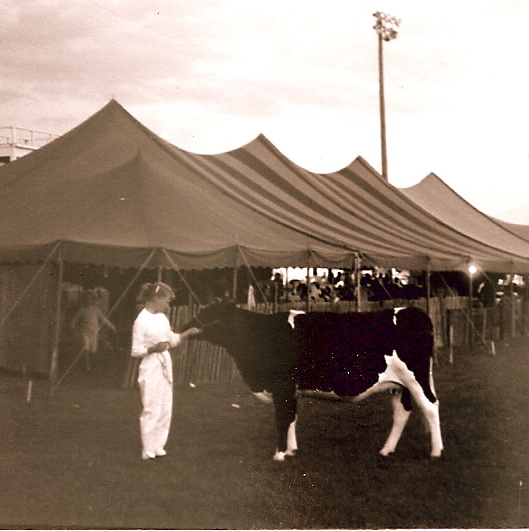 The year Bonita took her yearling calf, Black-eyes, to the 4-H fair was the year I fell in love with Statistics. Of course, I didn’t know the use of mathematics to prove or disprove a hypothesis was called statistics; I was still just a little girl. Still and all, that was the year I first appreciated the value of probability, level of confidence, and data sets. Besides a cow to clean and train, I had some knitting to finish and a cake to bake. I finished all but the pon-pons on the tie-strings of the hat I knit weeks before the fair. Mom showed me how to make the pon-pons; then I was ready to display my work. Even though Mrs. T was my 4-H leader, it was Mom who made sure my knitting was perfect: first because she knit all us kids’ hats and mittens, and she wouldn’t stand for any mistakes in her own work, so I knew better than to stand for any in mine; second, Mom inspected my knitting, and told me to rip it out even if she found a tinsy, tiny mistake that nobody but her could see. I hated ripping out, ’cause it was so hard to get the stitches back on the needles straight, and if I ended up with a twisted or dropped stitch: rip it out again. Holy Mackerel that stunk. Besides, it was bad enough to make a mistake without having someone else point it out to me. Especially someone like Mom, who did all kinds of making stuff so good it looked like something in those store windows I wasn’t allowed to go into ’cause everything was too expensive to even dream about and I might knock something over and then have to buy some broken expensive thingamajig. I always got a blue ribbon in knitting. This is a cake I decorated. 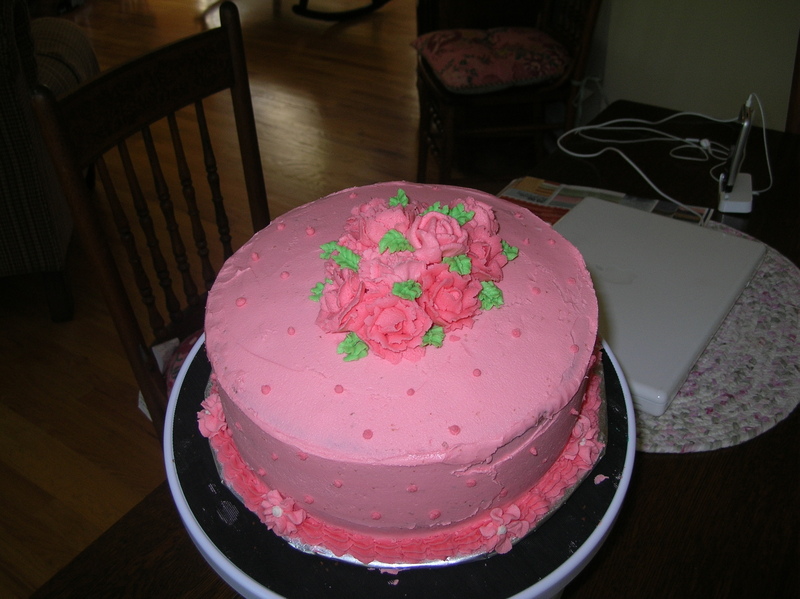 Decorating has lots of variability, but all that frosting won't cover up a bad cake. be, ’cause I could control everything: follow the recipe to the letter, make it the morning of the fair, and probability of success was super high. A big blue rosette, and off to the State Fair I went. In case you forgot, Ladybird was a registered Holstein, she was beautiful and she already proved the year before that she was a blue-ribbon heifer. Ladybird was almost 2 years old, this was her second show, so she nor I were the least bit nervous, she took a third place out of 25, a big yellow rosette, plus a blue ribbon. We knew what we were doing. Bonita and Black-eyes had the deck stacked against them. For one thing, Black-eyes was Lightfoot’s calf, no papers; she was leggy, and was more white than black, in the cow-world, Black-eyes was kinda lacking in the looks department. I guess Bonita figured that out ’cause she got nervous and jittery so bad she got one of her bend-over-I’m-sick stomach aches. To top it all off, there were about twenty calves in Black-eye’s confirmation category. Bonita was doomed. Then the worse thing possible happened. I ran over to get Black-eyes settled her down, while some man, all green around the gills, went to pick a limp Bonita up out of the dirt. I just gritted my teeth, and pressed my lips together tight as I could, so nothing sneaked out of my mouth, ’cause I knew Bonita was just embarrassed, and she figured if she acted hurt, she’d get lots of attention, rather than lots of ribbing. Well, to tell the truth, I saw her do it before with Dad; she knew how to ham up an injury better than anybody I knew. Of course, she was right. Everybody felt so sorry for her, all the rest of the day, complete strangers came up to her and asked her how she was feeling, and was she alright, and what an awful thing to happen to her. Yeah, right. Poor Black-eyes, I thought; she was scared half to death. After she got abandoned by the blubber-puss Bonita, I finished showing her; she only got a red ribbon. That’s something to just shove in your back pocket and keep quiet about. Ladybird and Me. I know you saw this picture before, but isn't she a beaut? In the evening we had showmanship: the dairy cows got judged on how clean shiny they were, if they could show off what good looks they had by stopping in a pretty way, and of course, how gentle they behaved. Showmanship classes went by the age of the 4-H-er, Bonita was sure Black-eyes would run again, but the announcer talked all gentle, and lucky for Bonita, only one other ten-year-old kid in 4-H that year. The worst she could have done, was a second place, she had a 1 out of 2 chance of winning, and a blue ribbon guaranteed. That Bonita got 1st place, a blue rosette and a blue ribbon. Me and Ladybird got another third out of 24; that was really way better, I beat 21 other people, not just one. Dad dragged Bonita’s trophy and the big blue rosette and the blue-ribbon out every time company came over, and even had the whole shebang in the car for a while so he could show off his winner-daughter, Bonita, to everybody he knew. Now that really took the cake. No more keeping my mouth shut: “I got a third out of 24. Bonita only beat one other kid. Plus she got dragged and laid there in the dirt like a ninny,” I said it every time, so that pretty soon, Mom had to take me aside and tell me to let Bonita have her day. I always did like a good logical argument, and this was just out of control. Oh, if only I knew then what I know now. If I just had the tools, I could have explained how a sample size of two is too small to prove anything, that there were too many variables out of control, that the sample sets the Bonita and I were in were too different to compare. All those tools would support my child’s logical argument, and a little more spotlight would have shined over my way and maybe even on my State Fair Cake accomplishment. On second thought, the probability of that happening is slim. Those of you reading who love statistics the way I do you understand what I mean. Sometimes, no matter what the pure and logical numbers shout out clear as day, people believe what they want to believe anyway. The data doesn’t show a line, right? Great story! I was just reading some of the past stories and found your precursor to this story. I love how you related part 2 of the story to statistics. Maybe more teachers should use real-life to help people understand the language of math…maybe it would make more lovers of math instead of haters. Probability is slim. You are absolutely on the mark, Shelly. But then I knew you would be!